How to manage Asthma in rainy season? Asthma is a chronic inflammatory disease of the airways or bronchioles resulting in difficult breathing. The inflammation of airways results in constriction and narrowing of the smooth muscles of airways causing difficult breathing, sputum production, cough and increased mucus secretion. Allergens: the substances like pollens, molds, fungi, pet dander and dust act as a major triggering factors for Asthma. Bronchial irritants present in the air: This includes smoke from vehicles, cigarette smoke, wood fire and pollution added by factories. Indoor bronchial irritants include strong odor of perfumes, paints, scented soaps and scented sticks most commonly used by Indian people during the prayers. Emotional turmoil: Sudden emotions like anger, fear, excitement or shock can cause attack of Asthma in the patient. Weather changes: weather changes like cold windy weather and during monsoon the Asthma attacks are known to worsen. Monsoon is associated with exposure of large amount of pollens in the atmosphere. During monsoon precipitation of toxic environmental gases like sulphur dioxide and nitrogen dioxide and sulphur takes place. This increases the bouts and severity of Asthma in Asthmatics. There is increased production of fungus, moulds, house dust etc. which can cause Asthma. 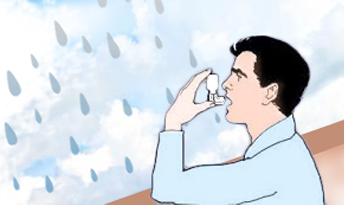 Increased incidences of viral infections during monsoon aggravate the attack of Asthma. Take the medicines regularly: Patients of Asthma should not skip even a single dose of medication prescribed by the doctor. Some of the patients are advised inhalers by their doctors. Patients of Asthma must regularly take them to keep their airways open. Some patients are in habit of haphazardly stopping and starting inhalers. This practice is very harmful and should be stopped immediately. Do not keep pet animals at home. If at all pets are already there in the house then they should not be allowed in the patient’s bedroom because the dander may stay in the bedroom even after the pet has left the room. As far as possible stay with the air-conditioner on in the house. Keep the damp places like bathrooms free of mould by regularly cleaning them with bleach and detergents and disinfectants. Do not keep plants in the bedrooms to avoid exposure to pollens. When it is very windy do not step out of the house so as to avoid contact with pollens. In rainy seasons there are many pollens found in the atmosphere. As far as possible do not use carpets. Because very minute dust particles, animal dander settle down on the carpets and cannot be removed easily. Wash all pillow covers, bed sheets etc with warm water once a week. These are the important suggestions about management of Asthma in rainy season. It is very important to note that homeopathy offers a very significant role in the treatment of Asthma. Homeopathic medicines when given under an expert guidance not only helps in reducing the severity of attacks but also reduce the frequent relapse of the disease. Homeopathic medicines act by increasing the immunity of the patients. Once the immunity of the patient is increased the frequency of Asthma attacks comes down drastically. Thus, the requirement of conventional medicines reduces and patient can be safely put on homeopathic medicines which are very effective, harmless and without any side effects.